Set in a sawmill town in the Pacific Northwest at the turn of the 20th century, this historical novel dramatically charts rising tensions that can only lead to disaster. 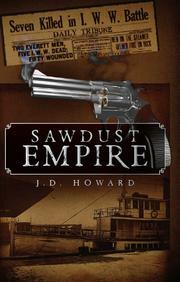 “The boom and bust cycle of Everett’s sawdust economy turned the town into a place of incredible extremes,” explains Howard (Both Sides of The Wish, 2013) in his historical note that prefaces this book. In the early 1900s, Everett, Washington, is the locus of the timber industry in the Northwest. Such is the demand for labor that it becomes widely known as a location where an unskilled worker can easily find a job. Wave after wave of newcomers arrive in hopes of securing a wage. As a consequence, the area’s demographics alter radically and rapidly, transforming Everett into a hard-drinking, hard-gambling, volatile town. The author captures this unrest from a variety of perspectives: characters range from the wealthy, conniving mill owner, Luther MacCullock, to the underpaid laborers toiling in the forest. The novel opens with the workers striking and observes the extremes to which MacCullock will go to control his employees. The sense of agitation slowly builds, heightened further by the arrival of the Wobblies, or Industrial Workers of the World, a radical labor union. The engaging novel boasts an ambitiously broad character list, which means that no individual is fully developed. This minor criticism is offset by the author’s enviable descriptive skills that bring Everett to life to the extent that a reader can smell the sweat and sawdust: “With every ax swing they bit deep into the yellow-white wood. Large chips of fir fell to the forest floor as the cool morning air filled their lungs. After four hours the undercut was done, and a breeze picked up. The crowns of the trees rustled and swayed.” Thoroughly researched with a deep understanding of the town and its people, this novel should be a must for anyone interested in the great American boomtowns. A tale about the timber industry that is as impressively rich and textured as the landscape it surveys.